And no, I'm not talking about the kind of bucket you use to water flowers in the spring or the kind of bucket for mixing paint. Nope. This is an imaginary bucket, full of all kinds of good thoughts and feelings, and everybody has one. As I write my last column about our favorite children's books, "Have You Filled a Bucket Today?" by Carol McCloud, seemed a fitting end to the year-long series. Grace is the best bucket filler I know! Although it's a best-selling book, and winner of the Mom's Choice award, it's one I heard of only recently. 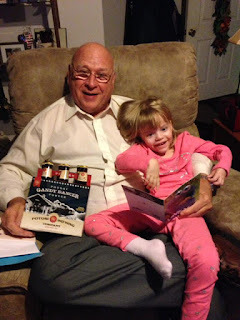 And after doing a little research, it was one of the first gifts we put under the Christmas tree for Grace this year. The premise of the book is simple, and though written for children, it definitely applies to kids and adults alike. "All day long, everyone in the whole wide world walks around carrying an invisible bucket. You can't see it, but it's there." The author says that each person has a bucket, and it only has one purpose, to hold all the good thoughts and feelings about yourself. "You feel very happy and good when your bucket is full, and you feel very sad and lonely when your bucket is empty." So, how does one go about filling this invisible bucket? The author reminds young readers that we all need other people to fill our buckets and they need us to fill theirs. And you can also fill your own bucket. How? Well, that part seems easy. You can fill someone else's bucket when you do something kind for them or make them feel special. But on the flip side, you can also dip into someone else's bucket and take from it when you are mean or say things that make others feel bad. "Many people who dip have an empty bucket. They think they can fill their own bucket but dipping into someone else's, but that will never work. You never fill your own bucket when you dip into someone else's." Wow. That's a tough one sometimes, but so very true. And that being said, you can't dip from another's bucket to fill your own, but when you fill someone else's bucket up, it fills your bucket too! "All day long, we are either filling up or dipping into each other's buckets by what we say and what we do. Try to fill a bucket and see what happens." The author begins to give suggestions on ways kids can help fill others' buckets and then their own. Things like saying "I love you" to mom and dad or smiling at your neighbors and friends. Most of the ideas are simple like saying hi to the bus driver or inviting a new kid at school to play. I'm sure we could make a list a mile long of ways to fill the buckets of others, both big and small. And wouldn't the world be a better place? After unwrapping all the presents, Grace and I sat down to read her new book on the day after Christmas. She just grinned page after page, mostly smiling at the brightly colored pictures. Grace is by nature a bucket-filler. She has a smile for everyone she meets, and doesn't have the ability to dip from anyone else's bucket. Such a precious gift. And I wish I was more like Grace all the time. Sometimes I find myself quick to anger over silly things, and taking from someone else's bucket just because something didn't go my way. Life isn't fair, and there are always going to be things that don't work out the way we plan or even the way we hope. But as easy as it is to get mad, it's just as easy to smile and relax and remember that helping to fill someone else's bucket will help fill your own too. That's my goal in 2017, to be a bucket filler to everyone I meet. I'm sure it won't be perfect, nothing in life ever is. But it's my hope that you will join me in becoming bucket fillers in the new year. "Bucket filling is fun and easy to do. It doesn't matter how young or old you are. It doesn't cost any money. It doesn't take much time. And remember, when you fill someone else's bucket, you fill your own too." The Grinch hated Christmas, the whole Christmas season. Now please don't ask why, no one quite knows the reason. Ever since Grace has been diagnosed with INAD, it seems that I become the Grinch, as soon as we turn the calendar over to December. Instead of the usual holiday cheer, I find the holiday tasks, like shopping and baking, to be just one more thing to get done, on top of taking care of Grace. Yes, somewhere along the way, I managed to lose that Christmas spirit that used to make me so happy. It starts with the shopping. Mom and I have a tradition of running over to Walmart on Thanksgiving night, just to look around. But I can hardly stand to look through the toy aisles. 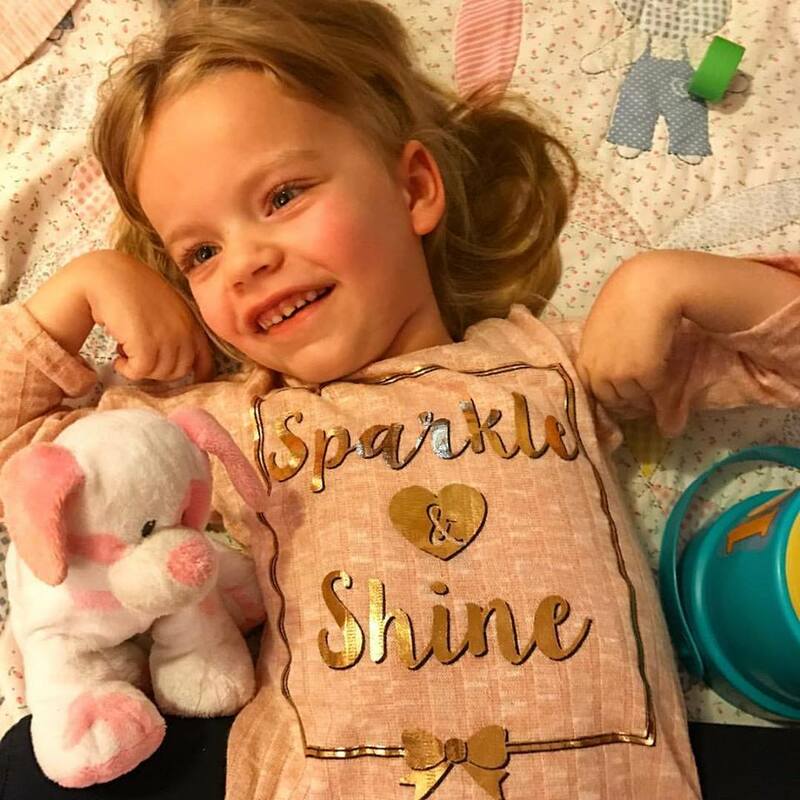 It breaks my heart to know that Grace isn't able to ask for any of the things in those aisles, and that she isn't able to play with them either. Every part of me wants to be able to fulfill her Christmas wishes, only Grace can't tell me what they are. When I was ready to start my Christmas shopping list, I wanted to bring Grace with mom and I, for the experience of shopping with her. Only part way through the day, her medical stroller broke, and it just seemed to add to my misery that nothing ever went right. Grace and her preschool friends in their Christmas program. Group photo after their program. I got home that night, with only part of the shopping done, and a particularly bad attitude about the holidays in general. I told Kyle that I thought I wouldn't be able to take Grace with me next year to go Christmas shopping, because it's just to hard to manage her with everything else going on. He was quick to remind me that I could leave her at home, but that I would be the one to regret not making those memories with her. I was still mad, but I admit it did make me stop and think. I get so wrapped up sometimes in the things Grace isn't able to do, like being excited to see Santa Claus, making a Christmas list, helping to decorate the tree or even singing in her Christmas program. But Kyle reminded me to look for the things Grace is able to do, and enjoy those memories for what they are, and not what I think they should be. If not, I'm the one missing out on making memories with Grace each holiday season. With her proud grandparents after the Christmas program. Grace's teachers helped her make this beautiful plate for us. So, I worked hard on having a better attitude. I didn't always do great, because it's hard not to wish things were different. But I don't want to miss making a single memory with Grace, and I will always be grateful for the time I have with her. Duty called the second weekend of the month, and after I covered the Nokomis Christmas celebration, I was heading to Schram City for a visit with Santa and Mrs. Claus. Kyle and Grace were at home, but he asked if they could meet me there. We have taken Grace there to see Santa nearly every Christmas, and she always has a smile. Helping daddy put the angel on the tree. Grace liked helping to put her ornaments on the tree. I asked if Kyle was going to put her in her Christmas outfit, and after a moment of silence, he told me she was already dressed and that it would be okay. I was a little disappointed, but I knew it would be more important to have Grace there than what she was wearing. When the two of them arrived, Kyle made sure Grace had a Santa hat on with her princess outfit, and she looked just adorable. Santa and Mrs. Claus were excited to see Grace, and she had more than one smile while she sat on his lap. No, she may not understand the concept of Santa Claus, but she certainly liked all the attention, and her smile made me happy. Grace likes to watch the lights on the Christmas tree. The next week was Grace's program at preschool, and as much as I enjoy seeing the kids sing, they are always hard for me too. Before Grace was born, Kyle and I used to talk about whether or not our children would be the ones singing loudly and dancing or hiding out in the back row. And sometimes it's hard that we've never had the chance to find out. As we sat in the church pew, Kyle grabbed my hand as the tears started to spill out down my cheeks. I would give anything to hear her little voice sing "Jingle Bells" or family favorite "Go Tell It on the Mountain." But just because she can't sing, doesn't mean she enjoys the program. She smiles during some of her favorite songs, and really seems to enjoy watching her friends be part of it. By the end of the program, my tears had turned to smiles, proud of Grace for always finding a way to smile, even when her mommy thinks that's hard. Christmas decorating at the house was another story though. We were in the middle of renovating our basement, which pretty much meant the entire house was a disaster, full of stuff everywhere. I was perfectly content not to set up a tree this year or any other decorations. After all, Grace wouldn't know whether or not we had a tree, and it seemed like just one more thing to do. 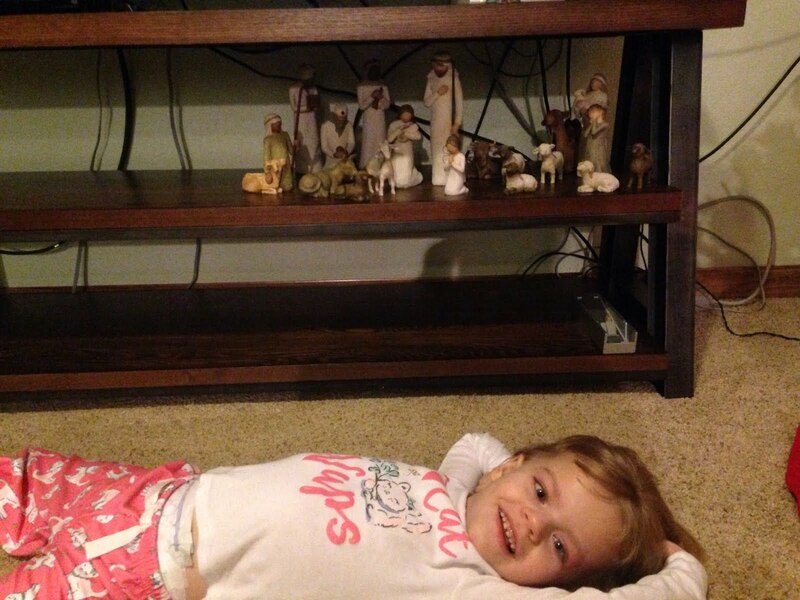 Helping to set up the nativity scene. But a rather cold and icy weekend gave us a little extra family time at home one weekend, and we decided it might be fun to set up a small tree in the basement, because we couldn't get to our regular one in the garage. After I set up the tree, Kyle helped Grace put the angel on top. Then we laid her underneath the tree as we decorated it with all of her ornaments. 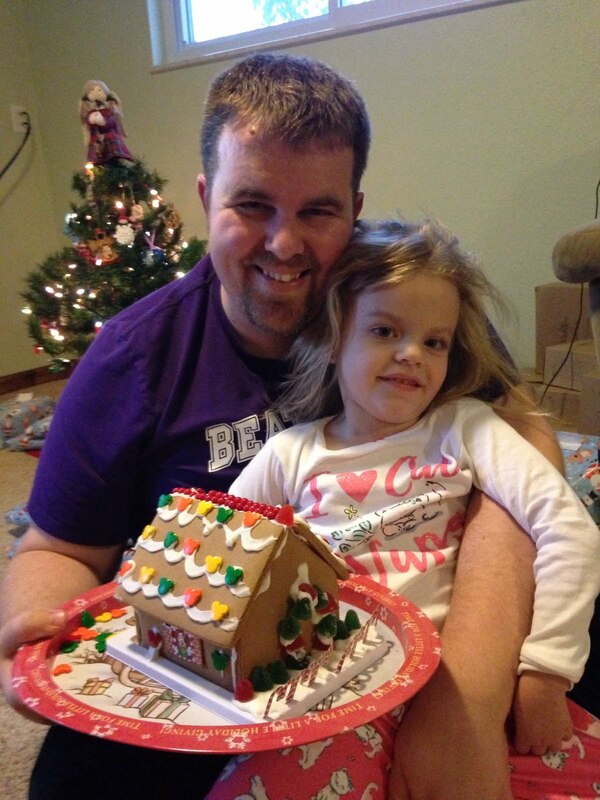 Kyle took care to show her each one before he placed it on the tree. It might not have been exactly how I remembered decorating the tree in my childhood, but it was still a special time. Grace and I were home a couple of nights when Kyle was at basketball games, so we watched Christmas movies on television together. 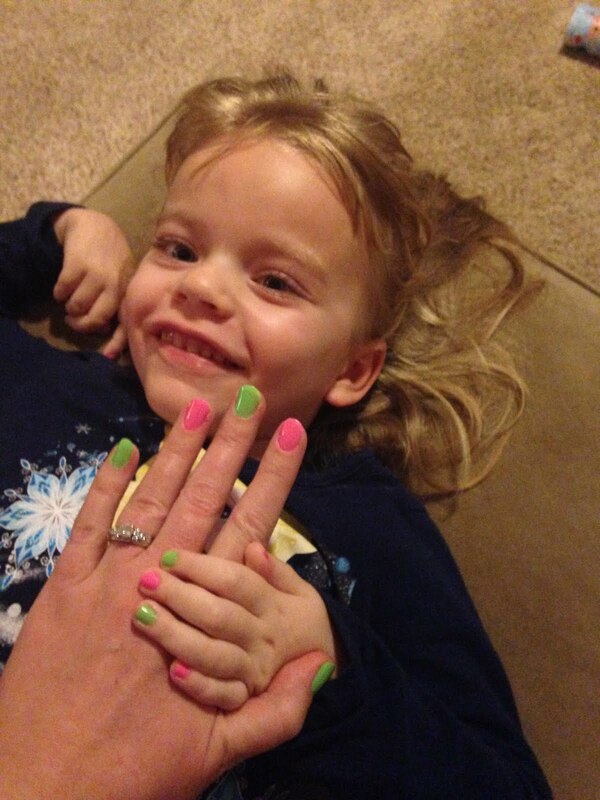 One night, we got matching pink and green manicures for Christmas, and the next, we set up the nativity set together. I showed Grace each piece as I got it out, telling her why it was important to the Christmas story, and then we read a couple of books, including one of my favorites, "Room for a Little One." Grace is all ready to make a gingerbread house. Grace and her daddy were in charge of decorations. 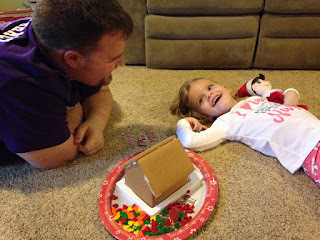 We even found time on Christmas Eve to put together a Mickey and Minnie Mouse gingerbread house. I was in charge of construction (which is probably why a piece of the roof already fell off), while Kyle and Grace were in charge of the beautiful decorations. Even though Grace couldn't really "help" with the decorating, Kyle always asked what she wanted to do next and where she wanted to put the candies. We smiled and laughed the whole time, never once thinking about the fact that it wasn't perfect. So proud of our beautiful gingerbread house. So you see, even though life isn't perfect, you can dig deep and find a way to make memories that will last forever. I'll be honest, some days, it's easier to be miserable, but I will tell you that it's definitely worth that extra effort to find your smile and make the best of whatever situations life throws your way. It's not always fair, but I guarantee it will be worth it. Even though I started the holiday season as the Grinch, I found myself celebrating Christmas Eve feeling like George Bailey, the richest man in Bedford Falls, from my holiday favorite "It's a Wonderful Life." Because it truly is ALWAYS a wonderful life. With just a few days until Christmas, we enjoyed our second family get together celebration, this time with the Armours, which is Kyle's mom's family. Daddy and Grace cheesing in their Christmas outfits. Despite an icy weekend, the roads were cleared in time for the party, and even though temperatures were just above zero, there was plenty of warmth at the party. Once again, we dressed in our darling Christmas shirts and Grace wore her Rudolph outfit. We definitely looked like we were ready for some Christmas fun. And Grace loved seeing all the kids, especially our nephews, Keelen and Quincy, who are one this Christmas and lots of fun to watch. After we got there, we had a chance to visit with Kyle's Grandma Virginia for awhile, as she and Grace have always had a special relationship. It was also fun catching up with family members that we don't see nearly often enough. Hanging out with Katelyn, Kensey and Kayley. Family photo with our smiling princess. The Armours serve several types of soup for lunch, and there's always plenty of great things to eat. After we finished, Grace enjoyed a pediasure, along with a snowman Christmas cookie for good measure. Grace got a new book called The Gingerbread Pirates. We had a lot of fun taking family photos and just hanging out throughout the afternoon. Grace had fun helping me open her presents. She got several new books, including The Gingerbread Pirates, which quickly became one of Kyle's favorites, a bright yellow Care Bear and some warm, fuzzy Elsa socks, which she has worn almost every day this week. Snuggling her new Care Bear. All too soon, it was time for Kyle and I to head into work. We left Grace with Papa Randy and Grandma Kim and plenty of people to cuddle with, including some of her favorites, Kayley and Kensey. Although the time is never long enough, it's always nice to have everyone together and celebrate family throughout the holiday season. We certainly started off our December in the right way with a family trip to Washington D.C. for a very special occasion. Uncle Johnny was being promoted to Major in the United States Air Force, and we were so honored to be there for his special day. Grace was asleep when Johnny brought her a new stuffed bear, named Major. Family photo opportunity before leaving for the Pentagon. Mom and dad left a day earlier than we did, so Kyle, Grace and I made our way to the airport on the first day of December. Although we ran into a few bumps since our flight was delayed, we made it to the nation's capital fairly easily. We did miss the family dinner the first night, but after catching up on some sleep in our hotel room, we were ready for the big day. Grace helping Uncle Johnny pin his rank on his flight cap. We were SO honored that Grace got to be part of the ceremony. The morning of his promotion ceremony, we enjoyed brunch with both my family and Emily's family, who had made the trip from suburban Chicago. While we were there, Johnny gave the littles (Grace, Zoe and Arlie), all blue Air Force bears. We named Grace's "Major" in honor of such a special occasion. Then all 18 of us made our way to the Pentagon for the ceremony. I told Johnny he gave Emily the hard job of keeping all the rest of us together on the way there. This little girl was SO happy to help and wear Uncle Johnny's flight cap. This one is my favorite photo from the ceremony! But we made it in good time, and after everyone got through security, Johnny gave us a tour of the Pentagon. It was very impressive. Kyle was immediately impressed by the upscale candy store in a shopping area. The tour included stops at many memorials to Pentagon victims, who died on Sept. 11. We even stopped by the chapel, which was very humbling. All smiles with Grandma and Grandpa after the ceremony. Smiles for Uncle Johnny too! After the tour, Johnny took us up to the floor where his office was located, and we made our way to the ceremony. There were about 70 people there for his promotion ceremony, and we were lucky enough to have seats in the front row. I took a lot of photos, while Kyle snuggled with Grace. One of Johnny's first bosses, General Wayne Monteith was the presiding officer at the ceremony, and he told some really great stories about him over the years. 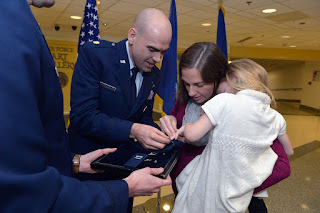 Johnny also asked that Grace be included in the ceremony, and she had a chance to pin his new major's rank onto his flight cap. Emily and both sets of their parents also helped with the ceremony as well. The whole crew with Major Galer. 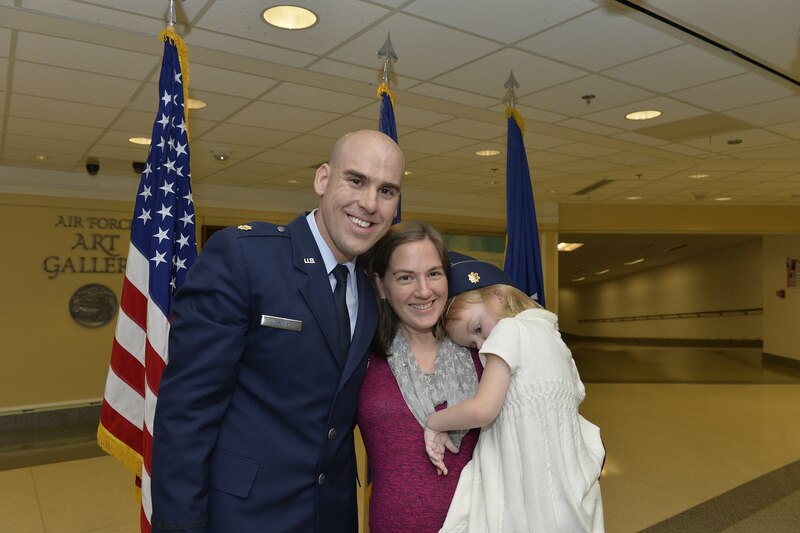 Major Galer and his family. It was so touching that he included Grace in the ceremony, and she has gotten to be part of some really neat things in her five years. After she helped him, she got to wear his flight cap for a bit, and we got some cute photos. Johnny and I even recreated a photo from when he was commissioned as a second lieutenant at the University of Illinois, and I was wearing his flight cap. I got to wear Johnny's flight cap again . . .
One of the coolest things about meeting the people Johnny works with is that many already knew our story and they couldn't wait to meet Grace. It seems that she has touched so many lives in her short life, and we feel blessed that people continue to share our story. After a cake and punch reception, we headed back to the hotel to rest and then back over to John and Em's for dinner. It was nice to be able to relax some and just enjoy being together. Snuggling with Uncle Johnny and her new Major bear. This was the best photo we got of the three littles and their new Air Force bears. On Saturday morning, Kyle, Grace and I walked around downtown Alexandria, and caught a Scottish Christmas parade before finding a quaint little restaurant for brunch. That afternoon brought a reception for Johnny and Emily, which was fun to meet more of their friends. All too soon, it was time to head for home, back to reality. And saying goodbye was a little easier because we know we will see them again at Christmas time. I'm so grateful that Grace is such a great traveler and so easy going, even when she's off schedule or in a new place. We feel so fortunate for all the chances we have had to take her places, and hope to return to Washington D.C. with her again soon. Until then, we'll always have the memories of a "major" fun trip. 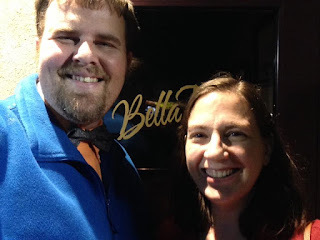 As we turned the calendar over to the hustle and bustle of the holidays in December, it reminded me that we haven't done a lot of blogs lately. It doesn't mean we haven't been busy, but we've been having too much fun and not enough time to share it all with everyone. We are ALWAYS grateful for Grace snuggles! We started the month with a routine check-up with Grace's neurologist at Children's Hospital in St. Louis. Although there's not really much to discuss, he spent a long time with us, and we know we have great support there when we need it. We also stopped by Washington University to see our friend, Dr. Kotzbauer and Zach Silvers, who are working tirelessly on research and funding for that particular INAD study. Dr. Kotzbauer is always so kind and generous to make time for us when we are in St. Louis, and he said they continue to make good progress on the study. Keep praying for that miracle! 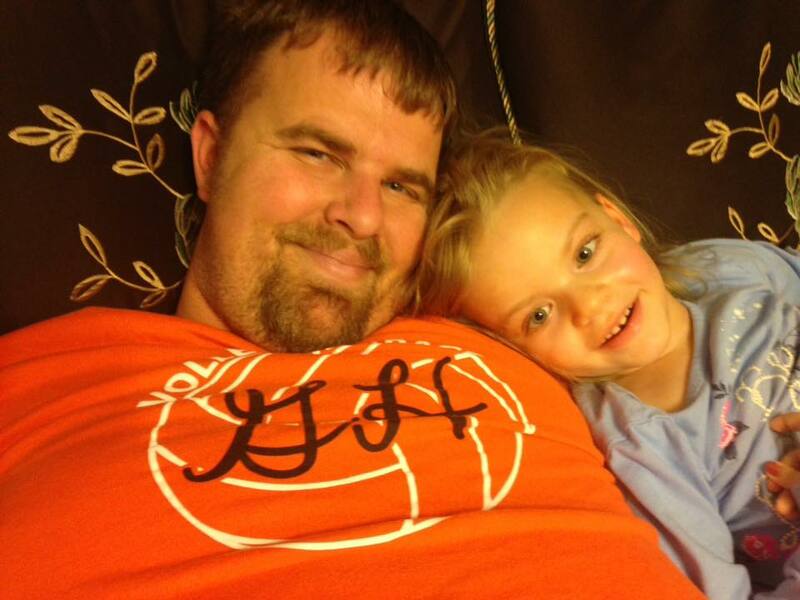 Kyle and I both believe he and his team will find something to help INAD kids someday. We capped off the evening with a visit to Kyle's sister's house and dinner with his family. It was a quick visit, but it's always just so nice to be together. That weekend, we celebrated Grace's preschool class with a program at our church. Once a year, the kids sing songs during the service, and it's always such a special time. Even though Grace can't sing any of the songs, her face still lights up in a smile when it comes time for some of her favorites, which just melts my heart. She also really enjoyed seeing some of the kids in the afternoon class, who were in her class last year. They all make a point to come and talk to her, and it's very special to us. Grace and her friends singing in their preschool program. 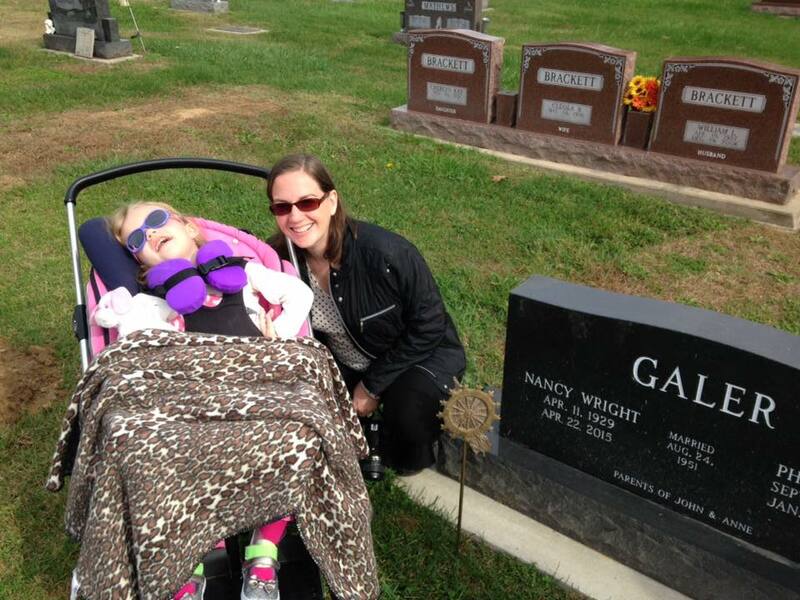 We also celebrated Grace's great-grandma Nancy with a special ceremony with the Daughters of the American Revolution. I became an official member this year in my grandma's honor, and they had a service at the cemetery to dedicate the DAR marker on her gravestone. I'm even hoping Grace can join the DAR with me some day. Celebrating Grace's great-grandma Nancy, and her dedication to the DAR. November also means election month, and nearly every election we have voted in, we have taken Grace with us. It's just important to us to do it together as a family, and we just enjoy taking Grace with us. She did get to vote with her preschool class that morning, though. They voted on whether to have popcorn or cheeseballs for a snack that day. If only, all the choices in our elections were that easy. 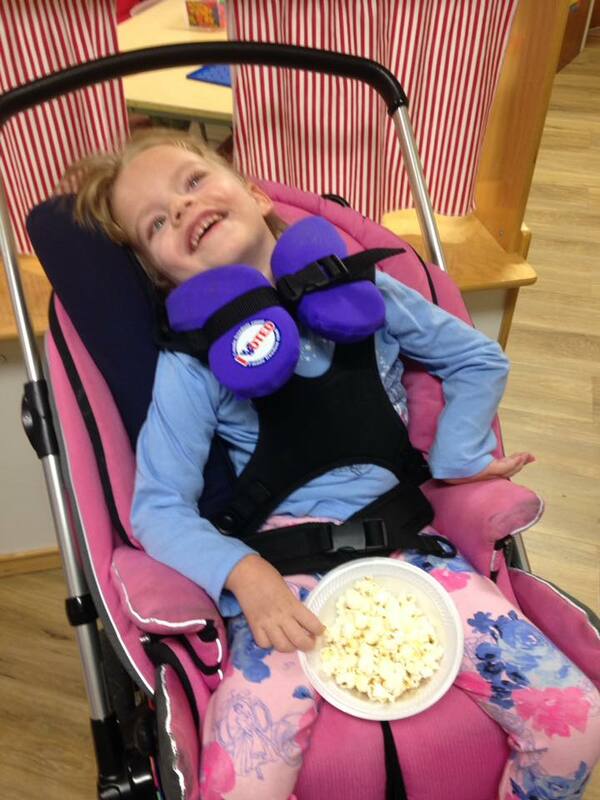 This little "cheeseball" voted for popcorn in her class election. At church on Sunday, it was time to pack shoeboxes as part of Operation Christmas child. 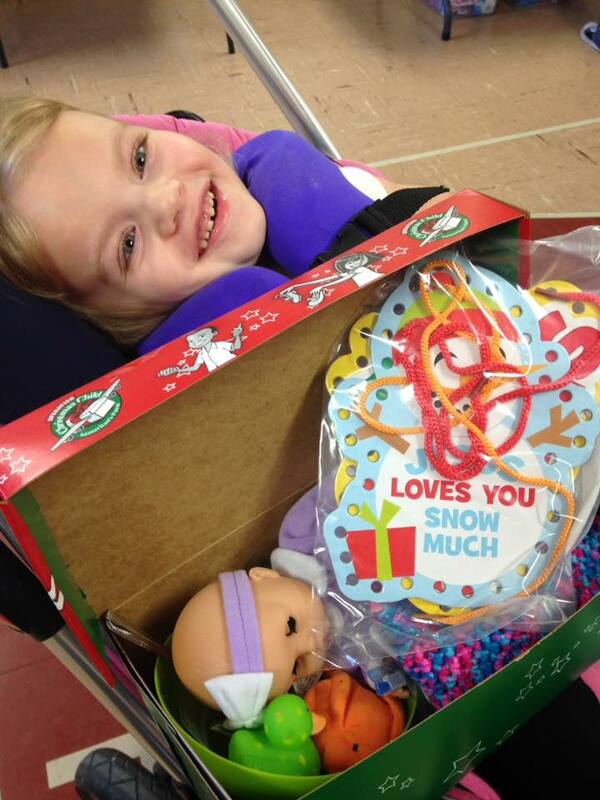 This year, Grace helped the other kids at our church pack 200 boxes to be sent to children all over the world. She and I carefully picked a box and then I showed her all the items we were sending to some very special kids. I picked purple things a lot, and Grace would just smile at me. Somehow I think she knows how important that job was. 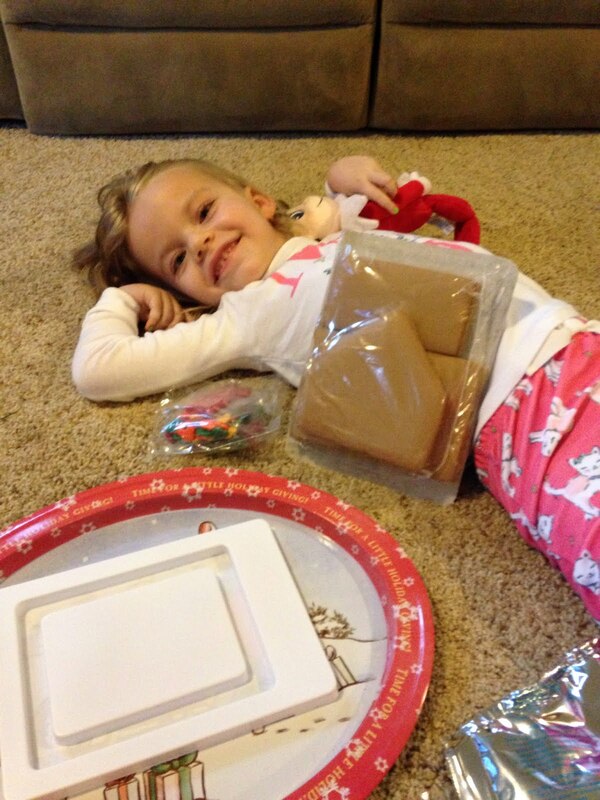 Grace loved helping me pack shoeboxes for Operation Christmas Child! The middle of November brought us to Ice Cream Man, where I had an assignment. Several weeks earlier I had done a story on an author who used to live in Litchfield and wrote a book on ice cream all over the world. 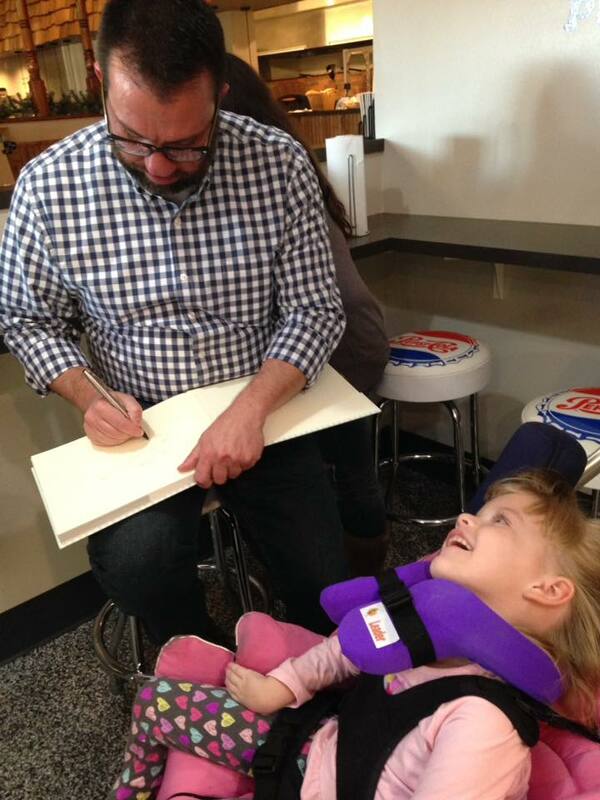 He was going to be signing copies in Litchfield, and taking the headache challenge, so we thought we would take Grace to meet him. She even got her own signed copy of the book. Ice cream has always been a bit of a special bond between Kyle and Grace, so it was really something fun to do together as a family. And since Kyle had finished the headache challenge, he was especially excited to see that the author had signed Grace's book with a message that her daddy ate ice cream better than him. We are always looking to share our story on this Grace-Filled Journey, and it was fun to meet the Ice Cream Gypsy. Grace got her book signed by The Ice Cream Gypsy, Steve Simpson. We also celebrated PaPa John's birthday that weekend! All too soon, it was time for Thanksgiving. Ours started a little before the actual holiday with a program at Grace's preschool. Dressed as pilgrims and Indians, the kids sang a few Thanksgiving-themed songs and shared "thankful stew" with us after the program. Our little Indian did a great job, and we were so excited to see her program. Grace and cousin Izzy after their preschool program. Family photo opportunity after Grace's program. When the week of Thanksgiving rolled around, we felt grateful to share some wonderful memories with our families. The night before, we enjoyed a quiet dinner with my mom and dad, before having lunch with Kyle's mom and dad and brother, Shane on Thanksgiving day. Before we headed for home, we stopped by my aunt and uncle's house to share a little Thanksgiving cheer there as well. 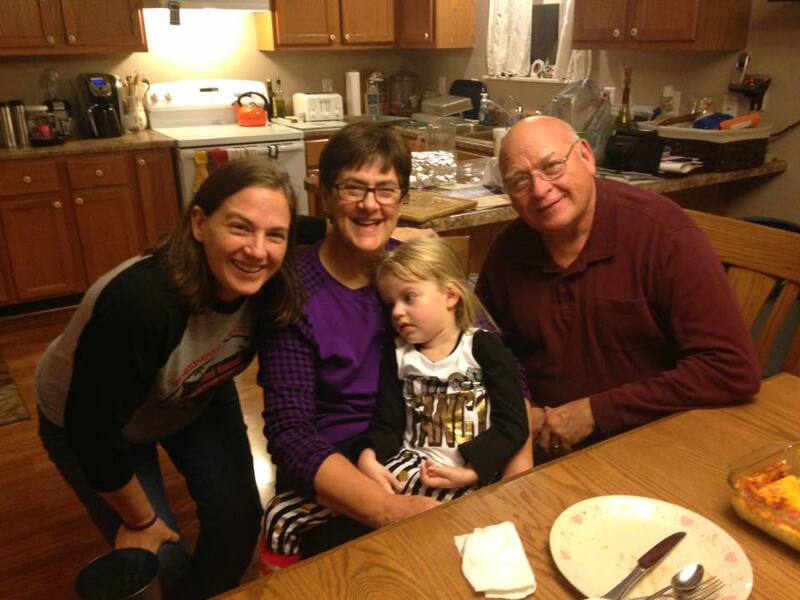 Sharing a meal with Grandma and Grandpa Galer before Thanksgiving. 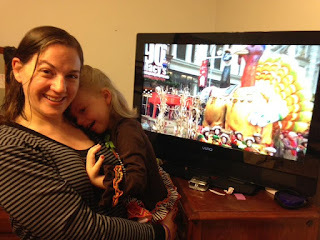 Watching the Macy's Thanksgiving Day parade together! 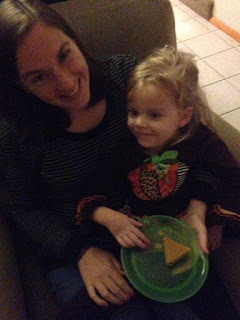 Enjoying some of Grandma Kim's homemade pumpkin pie! The end of the month even brought a date night for Grace's mom and dad. It started with a basketball game for work, but ended with a trip to one of mommy's favorite restaurants, Bella Milano, and then a trip to the movies to see Fantastic Beasts. We have really enjoyed reading Harry Potter to Grace, so it was fun to see the newest movie from the wizarding world. Kyle and I feel very blessed to have the chance to enjoy a date night together every now and again. It's always a lot of fun! Date night selfie . . . It was hard to believe how many things we did in November (I even had to look back through ALL the photos to remember). But in this month of thankfulness, we are always so grateful for everyone who shares a special part of this Grace-Filled Journey.